Biopuncture is a therapy whereby specific body locations are injected with biologically active substances which are physiologically regulating. These substances are used to treat pain, swelling, inflammation and toxin accumulation, among other problems. Most injections cause only minor discomfort because they are very shallow, given just under the skin or into the muscle. Products commonly used in Biopuncture are arnica, echinacea, and chamomile. Biopuncture produces its clinical effects because it stimulates your immune system and restarts your healing capacity. The goal of Biopuncture is to stimulate the natural inflammatory processes in order to get a complete and natural healing of the injured tissues. So, we do exactly the opposite of conventional drugs. 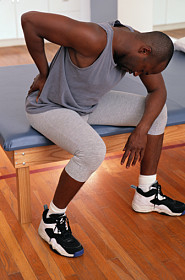 As a result, the symptomatic relief may take longer, especially for chronic cases. But when approaching acute injuries, such as sports injuries or whiplash, the effects of the injections are apparent almost immediately. Common indications for Biopuncture include: neck, mid back, lower back and sacro-iliac pain; various tendon problems (tennis elbow, golfer’s elbow, patellar tendonitis); shoulder pain; knee pain; tension headache; etc. Biopuncture is very successful for treating sports injuries.